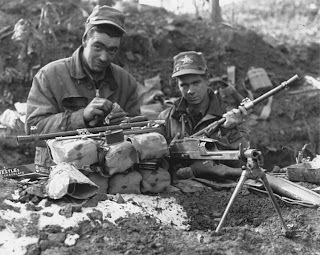 Ken served with the 2nd and 3rd PPCLI. 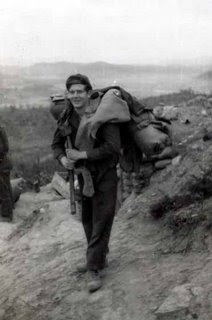 He went to Korea as reinforcement for the 2 PPCLI. 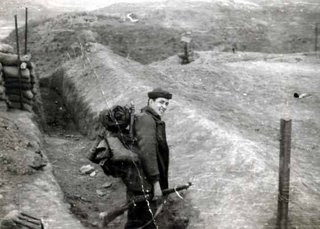 Pictured above as he is taking a carpet back up into the hills to add to the muddy bunker. 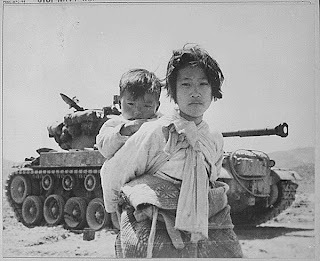 He learned his trade well as a scrounger during his period in Korea. He is a member of Unit 17 KVA in Winnipeg Manitoba. 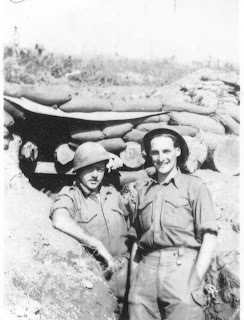 This picture was taken in September 1952, me on the left and my mate Larry Francisco who has lived in England for the past 50 odd years. 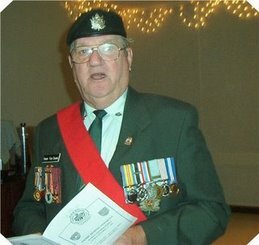 Vic has kept a close relationship with many Canadians over the years and has come to Canada to take part in our KVA Conventions, as well Vic has entertained many of our Canadians that have gone over to Australia for a visit over the years. 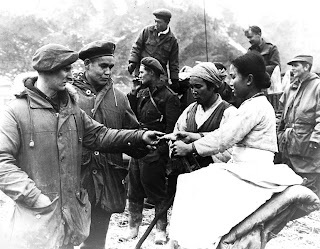 For this we thank him and his fellow comrades. 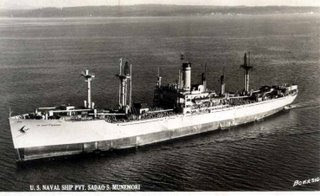 US Naval Ship PVT SADAO S MUNEMORI. 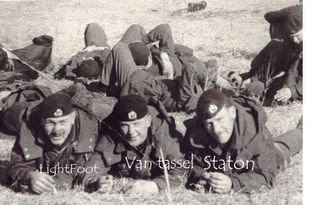 Left to right Norman Van Tassel served with the 2 QOR of C Wayne Van Tassel served with the 1st & 2nd Bn QOR of C and Clyde Richard served with the 2 RCR and Black Watch. 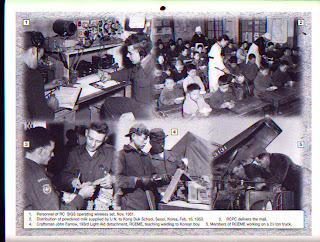 Norm served in Korea with the 2 QOR and Clyde Richard served in Korea with the 2 RCR. All three served 4 terms and got out of the service. 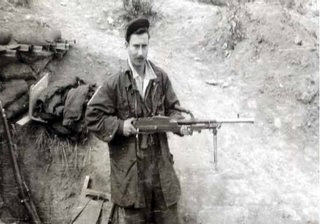 Clyde Richard passed away in 1996. Wayne resides in Timmins, Ont and Norm reside in Winnipeg Manitoba. He has enjoyed doing this blog hopefully you will enjoy reading it. Paul is a member of # 4 KVA Unit in London Ontario and has been responsible for the National Kit Store for the past several years. As of 2007 he is the vice President of KVA National, President of the Hertiage Unit and is still looking after the National Kit Stores until he can find a replacement. 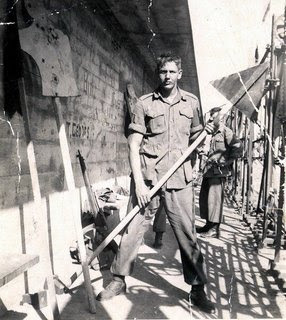 Bruce Wareing of LDSH (RC) during his tour of duty in Korea Bruce is sitting on Hill 355 (Note the barrel of the tank sticking out. 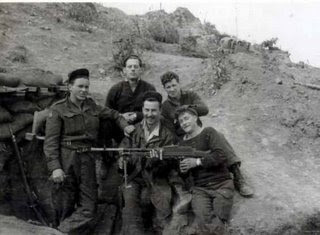 The Bren Gun Section of D Company, 2 PPCLI in Korea. 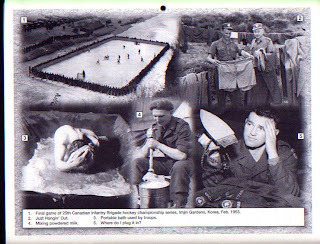 Denis LaFreniere member of Unit 76 was a medical assistant in Company HQ with D Company and passed these pictures on to us . 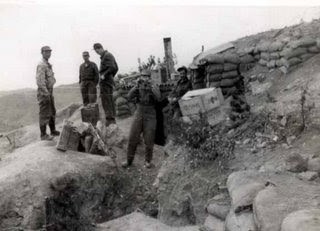 This is after the battle of Kapyong. 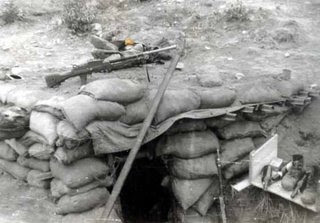 It does give us the understanding of living conditions at the time.